- Removable welded steel frame. - Swivel wheels with shock absorber and steering lock. - Foot plates dia. 7.3 in. on bearing. 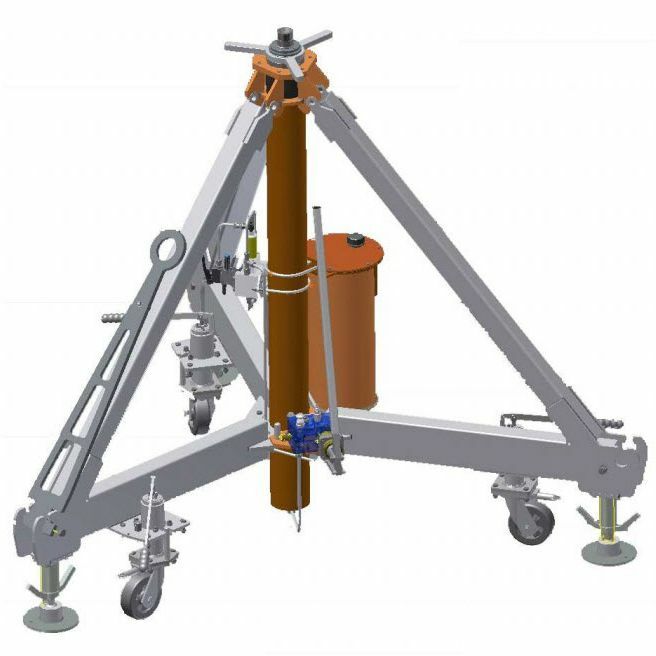 - Hydraulic lifting by hand pump and/or hydropneumatic pump. - Pneumatic lifting control (operator safety device). - Verticality by bubble level. - RAL 1021 yellow paint (standard color). - Other color on request. - Spring loaded heavy-duty swivel wheels dia. 6.3 in. - Removable towbar mountable on any tripod leg. - Height adjustable foot plates. - Automatic descent speed control (loaded and unloaded). - Dual speed hand pump. - Fitting points for load test tool. - Unpainted parts anti-corrosion treated. - Operation and maintenance manual (French and English). - Three years warranty (except paint and wear parts).